August is the target month. All the training for the year is aimed squarely at the beginning of this month, when I ride with the Huckleberries from the NY line in West Stockbridge to Sturbridge, MA. 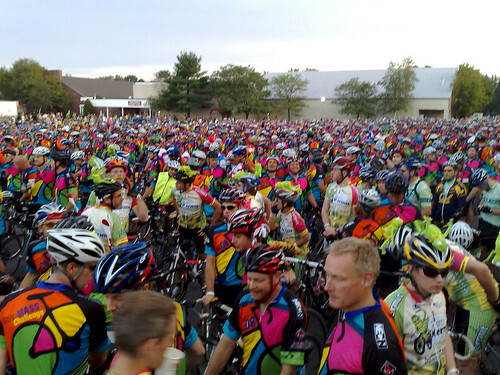 The next two days are the 188 miles of the PMC, from Sturbridge to Bourne the first day, and from Bourne to Provincetown the second. It's a lot of riding, but the anxiety about "will I be ready" is over. Either I'm ready or I'm not. Here are the stats for this month. Note that the first three rides are the PMC days. From left to right: Scott, Joel, Jon, Tom, Mark, Dave, Tim, Not Sure, Ellen, Me, Steve, Mike, Mark, Not Sure, and Steve. Could someone fill me in on the "Not Sures" please? Did I forget to mention that I was riding with Lilliputians? They may be tiny, but they make up for it with numbers! Not pictured: Jimbo and ?? ?, the guys that drove the sag wagon and kept us all alive. Also not pictured: Rawson Hubbel and his friend Mike (who caught up with us later), and two friends of Mark Stockwell who we picked up in Stockbridge at the Red Lion Inn. Now that you've met the crew, let me remind you of something. I started this year very heavy. In early April I weighed 278 pounds! Climbing hills wasn't just challenging, it seemed nearly impossible. I lost lots of weight, but in May I did the Birthday Loop with Steve and felt fat and slow. In June we started doing the birthday loop group ride, and Rick is so light and fast that he makes everybody feel fat and slow. Although I improved with every ride (which usually included some real hills), I never stopped feeling fat and slow. Imagine my pleasant surprise, then, when Mark Stockwell and I flew into Huntington more than five minutes ahead of the rest! After Huckleberries I even managed to be first up the monster climb on Route 66 (though Mark and I left a bit ahead of some of the others). No, it's not a race, and none of the other riders are "slow," but I surprised myself. The descent off Jacob's ladder was as amazing as ever. Miles and miles of gentle, downhill pedaling, looking through the forest on either side of the road, hoping to see bunnies and deer. It's so relaxing after the hard climb. HAH!! Yeah right! Mark and I rode down that mountain like our butts were on fire, and I hit my top speed of the weekend: 52.8 mph. I actually managed that while coasting in the steepest section. The road descends for at least nine miles, but after the first five or six it barely deserves to be called a "road." Pot holes and rocks replaced the road, and we had to drop our pace or risk flat tires and wipe outs. Gee, it would really stink to get a flat out there, wouldn't it? Would really hate to have to change a flat tire on the side of a mountain road... Yeah, anyway, I'll come back to this, as you probably guessed. Rawson and Mike caught us at our namesake, the Huckleberries cafe. At some point after the Route 66 monster climb, we regrouped and rode to lunch together at Atkins Farms Country Market. I ate better than in previous years: only half of a roast beef sandwich, a V8 (mostly for the salt, on the advice of Mike Lucas), and a bunch of grapes. Others in the group ate sushi. Sushi?! I couldn't do it. I like sushi, but it just makes my stomach turn when I'm riding hard. Some of the roads were in such terrible condition that we'd all gotten a little burned out from pointing out every significant hole and bump. We were in a pace line — I don't recall now, four days later, if it was before or after lunch but I think after — and I was sixth or seventh back. I pumped it up with my frame pump, and managed to rip the stem off it just as I was finishing up. YEAH!! There's our fourth flat, same as the third flat. Tom worked his magic again, and I got on to start riding... and my back wheel was flat too! GAH! So I had originally double-flatted without knowing it, and then managed to make it a triple flat by breaking the stem while pumping the front wheel. NICE. Surely I belong in some record book for that one. I was next to Steve Weiss when he commented, "There's Sturbridge." I looked up and smiled. Because sometimes I'm evil. "As in... the town line?" While only 15 started in West Stockbridge, 18 finished with us in Sturbridge. We actually picked up four additional riders, so I'm not sure who is missing. Click the image for higher resolution. We all finished together at the Super 8 motel for pictures, and then I rode to the Comfort Inn where Corinne had already registered. I held bikes while Steve, Paul, Dave, Mark and Andy unpacked their car, then I went into the "retail area" to buy a couple of tubes (for the guys who loaned them to me when I triple-flatted) and a CO2 cartridge for Mark (owed it to him for two years). I got what I needed, but never managed to give them to their owners. Sigh. Dinner was the same as every year: held out back under the big tent, and was exactly the same food as we have every year. Pretty good, if a little boring. I sat with Paul and Steve, and Chris and Donna Rawson. The owner of the hotel came into the shop where the mechanic worked, the day before (Thursday). He asked if they were doing any volunteer work at the PMC like most of the other shops in the area, but they weren't. So he asked if they'd like to. They would, but it was too late to set anything up this year, because "surely the PMC had paperwork or a process they had to go through..."
The hotel owner's response was, "I don't care about any of that. It's my hotel, and I'd like you to set up at my place for all the cyclists staying with us." So, that's what he did. He wasn't busy, so I had him retape my bars, and gave him a small tip. Corinne and I watched some of the opening ceremonies on TV, and then went to bed. I felt good, and was confident that this was going to be a great weekend. 100.25 miles (161.4 km) (including the ride from my hotel to the start, and from the finish to my new hotel) in 5h 10' 40" for an average speed of 19.36 mph (31.17 kph). Don't forget the search for granola & azul-berries the night before. This was my sixth year riding the PMC, and my fourth year to include the Huckleberries ride (which makes it a three-day event). 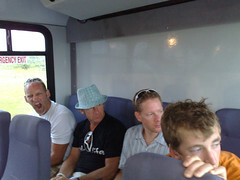 Those previous three years, I was totally exhausted on Saturday morning from the hard ride on Friday. This year was different. I woke up easily and on time (4:30), showered, had breakfast, and left at about 5:30 to ride back to the Host, where the ride starts. I was there at about 5:40. On the way in I saw someone that looked suspiciously like John Kerry riding out with someone else. Last year he had a mechanical on the starting line, so perhaps he decided to leave a few minutes early and avoid the crush. I don't blame him. Just 20 minutes before the start is a bit late to be arriving to a crowd of 3,000 cyclists. All the good spots in the "fast lane" were already taken. As were all the bad ones. I tried to weasel my way into the crowd a little bit, but quickly realized that wasn't working. The bikes were packed too closely together. So I stayed near the front line! I took a couple pictures of the crowd just as the National Anthem started. That's a big bunch of riders! Three Thousand at the Start! I also took a short video of the crowd during the National Anthem, then realized my helmet was still on. Without really thinking about it, I tried to take it off with the camera still in my hand. Makes for a roller coaster ride of a video! The microphone that the singer was using cut out just as she was finishing the National Anthem. The crowd finished it for her! Unfortunately, I pushed the button to stop recording just as the mic cut off. The weather was cool and dry, perfect for cycling. We rolled out at 6 (as we always do). Paul and Steve Davis arrived about five minutes behind us. We chatted for a minute, then we all rode out together. We hooked up with a really nice paceline and were just flying down the road for a long time. The strong riders did most of the pulls, but the slower ones knew to keep them short so the pace was kept up around 26-27mph. Paul was on the edge of bonking, so he and Steve pulled off to ride in at a slower pace (Dave had pulled off a few minutes earlier). I don't know the exact timing, but I was almost done with my lunch by the time I saw them riding in. Steve's Mom and Dad were there at lunch (with a cooler full of cold, wet towels! Yay!). Again, we all chatted for a little while, then Dave and I left together. (There are about 40 miles left after lunch.) As we were leaving, a bee stung Dave right through his sock! He said he was "a little allergic." It didn't kill him, but it swelled up like a golf ball almost immediately and obviously hurt quite a bit. We kept the pace low, and the Davises (Davisses? Davis's? Davu?) caught up with us in another paceline. Dave vanished off the back at some point. I never saw him go, and didn't see him again until after my massage. 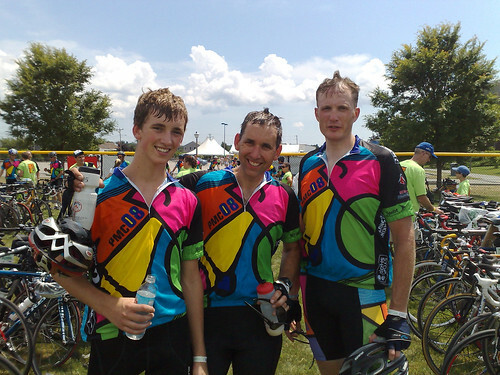 Steve, Paul and I finished together at just before 12:30. Stats: 112.66 miles (181.3 km) in 5h 34' 28" for an average speed of 20.21 mph (32.53 kph). Like the shark-fin hair? Helmet head at its best. Massages were available as early as 1:15 (we were pretty early), but I needed to ride over the Bourne Bridge, shower, and return before I could have one. So I took one for 3:00, and headed out again. Every other year, I've put a bag on the truck in Sturbridge to be picked up in Bourne. This year I realized that was silly, since Corinne would be waiting for me at the hotel I could just leave the bag with her! We actually pulled into the hotel driveway at the very same second. She went in to register, but came out fuming in a few minutes. Even though we had paid for the room a year in advance and specifically reserved a room on the ground floor and canal-side of the hotel, they had given our room to someone else. "Please deal with this, honey!" So, I went in to see what could be done. We moved all the stuff into the room, and I took my much needed shower, ate a little, then drove back over the bridge toward the MMA. Stopped at the first PMC parking lot I saw, memorized the location so we wouldn't have a repeat of last year (when a bunch of us wandered all over Bourne trying to find the car), and took the shuttle back to the MMA. After a little snack, I headed to my 3:00 massage. I don't remember the massage therapist's name, but I remember that I was assigned to table 8 and that he was good. Much better than any previous year. Said he's been doing this for the PMC since they started offering complimentary massages in the early 90's and has done it every year except two. Most of the MT's are fresh out of school and still have a lot to learn, but he's been doing it professionally for a long time and the difference was amazing! He quickly found my trouble spots and focused on those: a spot between my shoulder blades was bad, but a rock-tight muscle in my left thigh was much worse. Back in the food tent I had some more to eat and sat with Steve, Paul, and Chris Rawson. Maybe my memory is playing tricks on me, but I seem to remember Chris's wife Donna being there also, though I'm not sure how she got in. Maybe she volunteered? Eventually the Davises and I moved over to the dugout with Dave Schlageter, Mark and Andy. At first there were just the six of us in one of the MMA dugouts. Then the rain started and it got very crowded. 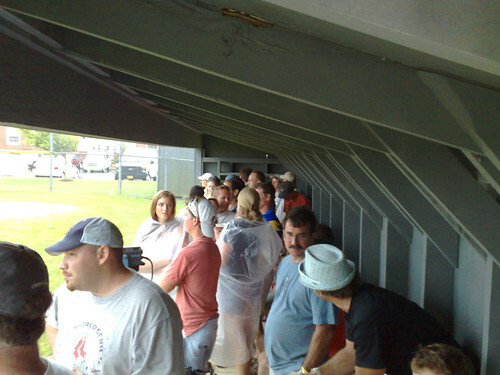 A thunderstorm moved in, and everybody lounging on the grass in the baseball field moved into the tents... or the dugouts. It was crowded. The wind picked up, and actually knocked over one of the support beams in the (very, very big) food tent! That was a little scary. The PMC admins panicked a little and tried to get everyone out, but I think the majority of the riders ignored them. The worst of the storm passed and the tent didn't fall down. That's good: the poles that hold the tent up are bigger than telephone poles. That could have been ugly, especially with over 1,000 people under the tent at any given moment. Dave, Mark and Andy were waiting to have their pictures taken as part of the John Hancock cycling team at the PMC. The rain screwed everything up, and somehow they missed the photo. The five of them were all going to dinner at a local lobster restaurant, and I (for the third or fourth year in a row) was going to drop them off. We took the shuttle back to my car, which quickly got stuck in traffic but at least we weren't walking in the rain! They asked me (at least twice) why I wasn't going to dinner with them (they ask every year): because it's my anniversary! Dave, Mark, Andy and Paul in the first picture. Paul and Steve in the second. Me in the third (shot by Steve). Click an image for higher resolution. Eventually we were dropped off near the car, which I didn't lose at all!, and I drove them to the restaurant. Steve and I agreed to leave at 5:30 Sunday morning, and he put my cell number in his cell phone in case of problems. If you read TruerWords via email, you'll probably want to visit that one on the web for the pics and videos. Due mostly to Steve's and Penny's wedding on Saturday, I didn't manage to ride from Friday through Sunday. By Monday afternoon I was so full of energy I couldn't sit still, so I went out for a short one. I had time for a longer ride, but knew I shouldn't burn too much before the Tuesday night Birthday Loop ride. Well, my enthusiasm got the better of me. Instead of riding long, I rode really hard. Like a time trial. After exactly 22 miles my average speed was exactly 22 miles per hour! That's fast, at least for me. Unfortunately, I wasn't home yet. 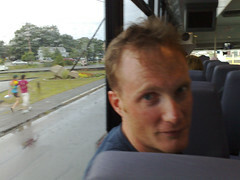 I had just crossed back over the Mystic River, ridden through downtown, and was turning onto River Road. I had one Gu with me, but hadn't eaten any and decided to continue home without eating it. That was a mistake, because my speed sank like a stone over those last four miles. Still my fastest solo ride of the year, but not what I could have done if I had eaten the Gu at the halfway point as I had planned. Stats: 26.19 miles (42.16 km) in 1h 13' 44" for an average speed of 21.31 mph (34.31 kph). Tuesday morning I had breakfast at Snoopy's with Rich, then worked from his place for a few hours (and had a small plate of pasta for lunch). On the way home I stopped at Mystic Cycle to pick up some more Gu and Power Gel, and get some chain cleaner: my bike is always a big mess after the PMC, and I wanted to clean it before the evening ride. Corinne and Mom both sat out on the front steps and chatted with me while I cleaned the bike. Mom thought I was coating my chain with something when I was actually doing the opposite. This was all a little odd, though, as I've been washing my bike like that for years and nobody has ever, not even once, sat out there to watch me work. Due to the chit-chat, it took me twice as long to wash the bike as it normally would. When Corinne mentioned it was 4:20, I rinsed the bike off and ran in to change my clothes. We had agreed to leave the shop at 5:00 sharp this week, so I had to leave the house by 4:40! Well, I didn't get out until 4:45, and arrived a few minutes late. 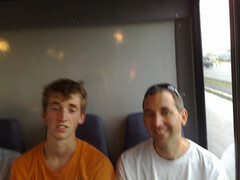 Didn't matter, because Rick (one of the partners, and the ride leader) wasn't ready yet. We left at 5:15, still earlier than last week. We left with five (Rick, Matt, someone from Mystic Velo, the blustery older guy who's ridden with us three or four times but I still don't know his name, and myself), and rode through/around two other pace lines on River Road and Rte. 201 the way to Wintechog. Both times, we picked up a couple extra riders, but they only stayed with us for a few miles. I was fine on Wintechog. Not fast, but I wasn't worried. Then on Rte. 2, heading to Cossaduck Hill, all the wind went out of my sails. Blustery-man set a devil's pace up the slight incline, and I stayed with them but knew I was working a lot harder than I should have. On Cossaduck it was obvious that I was having some trouble. I wasn't last up the hill (but only barely), but I was slower than I was the last two weeks. I recovered a little on the rest of 201 (but Matt quit, so there were only four), but then Gilliver put the hurt on me again. We kept the pace down on 49 so I recovered a little again. Wyassup Road starts with a very small, slight ascent (like 0.5% for 1/8th mile), which turns into a very slight descent and then dives into a fantastic free fall to the base of the first climb. Every week we do the same thing: Rick pulls up the baby climb, then rolls to the back to get on my wheel, even if he has to sneak in front of someone else. I told him I was feeling tired and wasn't sure I could do what he wanted. Still, I stretched my calves and relaxed my shoulders a bit with a few rolls, to get ready. Just before we hit the dive I accelerated hard and shot past the guys in front of me (who never expect this). I hit the bottom of the hill at 51.5 mph, my fastest ever for this ride. They waited for me at the end, before we crossed over Rte. 2 back onto 201. I'd recovered again, somewhat, and stayed with the other three. At the top of 201 I joked that this is the part where Rick loves to "race it," so I caught his wheel as he picked up speed. I yelled, "come on baby, go!" and he did. 30. 31. 32 mph, on relatively flat road. 33, 34. He signaled with his elbow and pulled off, and I kept the same pace... and shelled him! He was only a hundred feet back when we turned onto Wolf's Neck. I *think* this is where the Mystic Velo rider pulled off, but maybe that wasn't until after Town Farm's steep climb. Can't quite remember. Once we were back on River Road I told Rick that I was heading home after Oral School. I'd felt the telltale signs of cramping in my abductors, so let them ride ahead. Sure enough, I had to stop on Oral School Road to let the cramps pass: I couldn't even move my left leg for a minute. So, in the end I left out one of the climbs, but still did over 50 miles and managed this year's best pace ~and~ my fastest descent. No complaints! At least half of this ride was on soaking-wet, just-rained-on roads, but we never saw a drop of rain. In fact, most of the time the sky was blue and sunny! I've cramped up more this year than ever before. I'd love to know what's causing it. Rick suggested I need more salt, but I can't find anybody local that carries salt tablets! Stats: 54.27 miles (87.37 km) in 2h 45' 2" for an average speed of 19.73 mph (31.76 kph). Maybe next week we'll finally finish at 20 mph. Corinne totally made fun of me for this. Sigh. I guess she's right, that sounded a little goofy. PMC 2008: Day -1, "Holy Screwed Up Feet, Batman!"